Cholestasis is the blockage in the supply of bile into the digestive tract. It can be “intrahepatic” (the obstruction is in the liver) or “extrahepatic” (outside the liver). It can lead to jaundice, and is identified by the presence of elevated bilirubin level that is mainly conjugated. 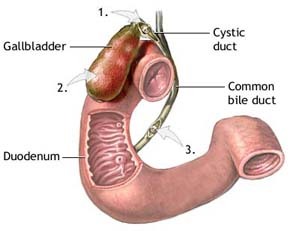 Biliary colic is when a gallstone blocks either the common bile duct or the duct leading into it from the gallbladder. Up to 25% of all people have gallstones (cholelithiasis), composed of lecithin and bile acids. These can cause abdominal pain, usually in relation with the meal, as the gallbladder contracts and gallstones pass through the bile duct. Acute or chronic inflammation of the gall bladder (cholecystitis) causes abdominal pain. 90% of cases of acute cholecystitis are caused by the presence of gallstones. The actual inflammation is due to secondary infection with bacteria of an obstructed gallbladder, with the obstruction caused by the gallstone. When gallstones obstruct the common bile duct (choledocholithiasis), the patient develops jaundice and liver cell damage. It is a medical emergency, requiring endoscopic or surgical treatment such as a cholecystectomy. A rare clinical entity is ileus (bowel) obstruction by a large gallstone, or gallstone ileus. This condition develops in patients with longstanding gallstone disease, in which the gallbladder forms a fistula with the digestive tract. Large stones pass into the bowel, and generally block the gut at the level of Treitz’ ligament or the ileocecal valve, two narrow points in the digestive tract. The treatment is surgical. Cancer of the gallbladder is a rare but highly fatal disease. It has been associated with gallstone disease, estrogens, cigarette smoking, alcohol consumption and obesity. Despite aggressive modern surgical approaches, advanced imaging techniques, and endoscopy, nearly 90% of patients die from advanced stages of the disease and experience pain, jaundice, weight loss, and ascites. Polyps (growths) are sometimes detected during diagnostic tests for gallbladder disease. Small gallbladder polyps (up to 10 mm) pose little or no risk, but large ones (greater than 15 mm) pose some risk for cancer, so the gallbladder should be removed. Patients with polyps 10 mm to 15 mm have a lower risk but they should still discuss removal of their gallbladder with their physician. Of special note is a condition called primary sclerosing cholangitis, which causes inflammation and scarring in the bile duct. It is associated with a lifetime risk of 7% to 12% for gallbladder cancer. The cause is unknown, although primary sclerosing cholangitis tends to strike younger men who have ulcerative colitis. Polyps are often detected in this condition and have a very high likelihood of malignancy.